"Have you seen some of those ISIS propaganda videos, they are cut like action movies. Where is the counter narrative?" — Riz Ahmed, actor. Britain's foreign aid budget is reportedly funding at least two dozen Palestinian schools, some of which are named after terrorists and murderers and which openly promote terrorism and encourage pupils to see child killers as role models. March 1. A new Channel 4 documentary series called "Extremely British Muslims" showed the inner workings of a sharia court inside Birmingham's Central Mosque. In the first episode, viewers witnessed the case of mother-of-four Fatima, 33, as she sought permission to divorce her drug dealer husband she says has abused her throughout their 14-year marriage. According to sharia law, Muslim women must plead their divorce cases in court, while Muslim men need only to say the words "I divorce you" three times to obtain a divorce. Birmingham Central Mosque said it allowed the sharia proceedings to be filmed in an effort to "break down misconceptions about Islam." Some 100 sharia courts in Britain are now dispensing Islamic justice outside the remit of the British legal system. "If we fail to represent, we are in danger of losing people to extremism. In the mind of the ISIS recruit, he's the next James Bond right? Have you seen some of those ISIS propaganda videos, they are cut like action movies. Where is the counter narrative? Where are we telling these kids they can be heroes in our stories — that they are valued? If we don't step up and tell a representative story we are going to start losing British teenagers to the story that the next chapter in their lives is written with ISIS in Syria." "Participation in sport amongst Muslim women is increasing at a rapid pace. It is imperative that governing bodies adapt and tailor their offerings to suit the changing landscape of sport, including those who access their sport." March 4. Ryan Counsell, 28, a jihadist from Nottingham who left his wife and two small children to fight with the Abu Sayyaf Islamist group in the Philippines, blamed his behavior on the Brexit vote. He told the Woolwich Crown Court that increased tension within the local Muslim community after Brexit sparked his decision to leave. He said that he wanted to escape Britain's political climate and seek an "idyllic life" under sharia law. He was arrested at Stansted airport in July 2016 and was later sentenced to eight years in prison. March 5. Homegrown terrorism inspired by the Islamic State poses the dominant threat to the national security of the United Kingdom, according to a comprehensive new report on violent Islamism in Britain. The 1,000-page report — "Islamist Terrorism: Analysis of Offenses and Attacks in the UK (1998–2015)" — was published by the Henry Jackson Society, a foreign policy think tank based in London. The also report showed a clear link between terrorism and growing up in Muslim-dominated neighborhoods. London was the place of residence of 43% of IROs, followed by West Midlands, with 18%. Of the latter, 80% of IROs were in Birmingham. The third most common region was North West England, with 10% of IROs. Together, these three regions contained the residences in almost three-quarters (72%) of cases. East London was home to half (50%) the London-based offenders, while the three most common boroughs — Tower Hamlets, Newham and Waltham Forest — contained the residence of offenders' in 38% of all London IROs (and 16% overall). March 6. British security services have prevented 13 potential terror attacks since June 2013, according to Assistant Commissioner Mark Rowley, the UK's most senior counter-terrorism police officer. He also said that there were 500 live counter-terror investigations at any given time, and that investigators have been arresting terror suspects at a rate of close to one a day since 2014. The official threat level for international terrorism in the UK has stood at severe — meaning an attack is "highly likely" — for more than two years. March 7. The managers of the cash-strapped Sandwell General Hospital near Birmingham are considering the construction of a special kitchen for preparing halal meals for Muslim patients and staff. The move follows complaints about the quality of halal meals that the hospital has outsourced to local vendors. A spokesman said: "We are still reviewing options around creating a separate halal kitchen and the best ways to provide a range of healthy halal options to patients and staff who want them." March 10. The BBC announced that it would begin outsourcing production of Songs of Praise, a Sunday worship program that has been produced in-house for 55 years. Critics of the move said they feared that Songs of Praise will lose its Christian focus in favor of Islam. Anglican priest Lynda Rose said a recent Songs of Praise episode featuring a segment about the Muslim faith, including Church of England children visiting a mosque, exemplified the "Islamization of the BBC." More than 6,000 people have signed an online petition calling for MPs to investigate the BBC after it appointed Fatima Salaria as the BBC's head of religious programming — the second Muslim in a row to hold the post. March 11. Britain's foreign aid budget is reportedly funding at least two dozen Palestinian schools, some of which are named after terrorists and murderers and which openly promote terrorism and encourage pupils to see child killers as role models. A Mail on Sunday investigation found pictures of "martyrs" posted on school walls, revolutionary slogans and symbols painted on premises used by youngsters, sports events named after teenage terrorists and children encouraged to act out shooting Israeli soldiers in plays. Head teachers openly admitted to flouting attempts by British and European donors to control the curriculum at schools. They reportedly print overtly political study aids for pupils, some even denying the existence of Israel, while teachers boast of encouraging pupils to emulate teenage "martyrs" killed in terrorist attacks in the region. One senior teacher from a prominent West Bank school, when asked what he would say to a pupil threatening to attack Israelis, said: "I would tell them go in the name of Allah." March 11. Islamic preachers may be asked to begin delivering their sermons in English under measures being prepared to rid Britain of hate preaching. The Telegraph reported that the government's counter-extremism taskforce is working on the plans amid concern that preaching in foreign languages enforces divisions between Islam and mainstream British society and can foster radicalization. "They [your children] may be inspired to strive for the restoration of the glory of Islam and Muslims. Jihad of warfare is where all humans spend their energies to stop a tyrant from being oppressive, for example when a tyrant makes it difficult for people to fulfill the commands of Allah to propagate Islam. "Tyrants must be subdued whether they rule in an Islamic or non-Islamic land, or whether they are on a battlefield. "It is the duty of Muslims to divert people from worshipping created things to the worship of the Almighty Allah alone." The book also rails against cinema and theater, arguing they are the work of "evil-minded" Jews, and warns of a Jewish conspiracy to take over the world. The book supports adulterers being stoned to death and Muslim schoolchildren being kept separate from others: "Education under unbelieving and atheist teachers results in them going astray. Dangerous, communistic and materialistic ideas grow in their minds." March 14. A father who describes himself as "Anglo-Saxon" lost a legal battle to prevent his Muslim ex-wife from sending their 10-year-old son to an Islamic secondary school. The man, who was not named for legal reasons, said he wanted to prevent his son from attending a "school inside a mosque" on the grounds that he would be "marginalized" by his son if he enrolled at the London-based school. The man's lawyer said that the mother and father had "different world views" and that it was client's wish that his son be educated in a "neutral" environment. The man and his ex-wife, both in their 40s, had divorced more than three years ago following a nine-year marriage. The man had converted to Islam but renounced his faith following the separation. The lawyer argued that the boy's Muslim faith could be adequately catered for at a secular school. A High Court judge dismissed the man's appeal on the grounds that an earlier ruling made by a judge at a family court — that the man would not be marginalized by his son — was correct. "At a time when populism and bigotry are at an all-time high, we fear that this ruling will serve as a green light to those wishing to normalize discrimination against faith communities. Many will be worried that this action will prevent Muslim women who choose to wear the scarf from securing jobs. And it sends a message that we cannot accept a plural society that recognizes and celebrates religious differences." "We have a strong tradition in this country of freedom of expression, and it is the right of all women to choose how they dress and we don't intend to legislate on this issue. There will be times when it is right for a veil to be asked to be removed, such as border security or perhaps in courts, and individual institutions can make their own policies, but it is not for government to tell women what they can and can't wear." "It has come to our attention that some Islamic materials were found in a skip [garbage dumpster] next to Book Centre. While the Book Centre site is being cleared, no Islamic material of any sort was purposefully disposed of. A small workforce was instructed to clear two storerooms from which some material made its way into the skip. This is wrong, unacceptable and a genuine mistake. The skip will be looked at as a matter of urgency and any materials removed." "Should our client have been aware that the previous owner would have sought to dispose of the Holy Koran and other books in this manner, they would have assisted in distributing the books to various mosques throughout the city. "Our client now hopes that the previous owner takes a more responsible course of action by distributing the books to those less fortunate and in need of Islamic guidance." March 18. The BBC apologized after a tweet from the BBC Asian Network account asked, "What is the right punishment for blasphemy?" The tweet provoked criticism that the BBC appeared to be endorsing harsh restrictions on speech. In an apology posted on Twitter, the network said it had intended to debate concerns about blasphemy on social media in Pakistan. "We never intended to imply that blasphemy should be punished," it said. 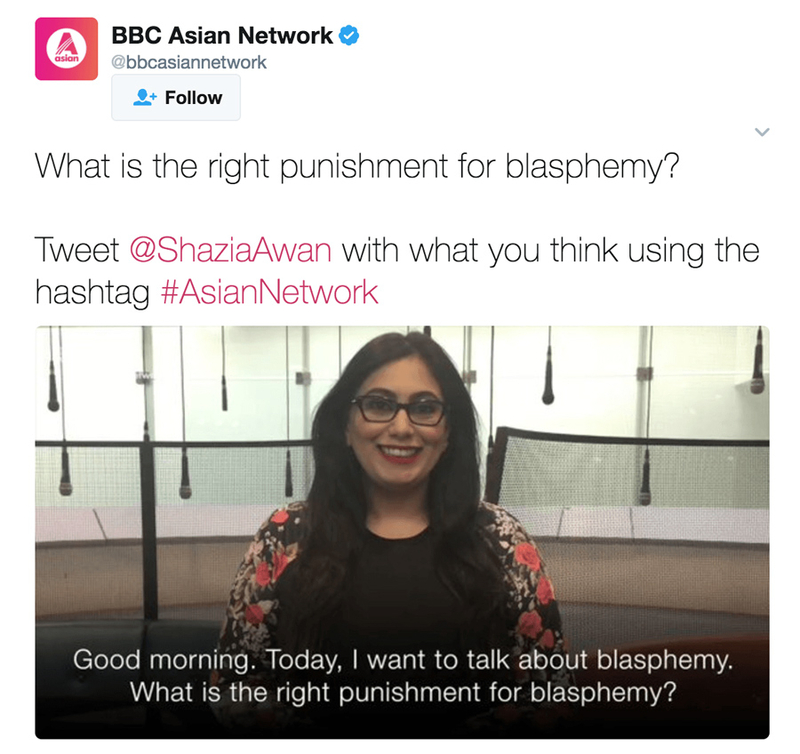 On March 18, the British taxpayer-funded BBC Asian Network account asked, "What is the right punishment for blasphemy?" March 20. Mohammed Karamat, 45, an imam at a mosque in Coventry who assaulted four children as young as nine, was spared jail time. Magistrates watched footage of Karamat twisting a child's arm, slapping a child, and using a pen to stab a child and pricking a child's hand with the lid of a pen. He was filmed attacking the children during a six-day period. Karamat, who admitted to four counts of assault by beating, was ordered to do 100 hours unpaid work. March 21. Minister for Higher Education, Jo Johnson, ordered British universities to include a clear commitment to freedom of speech in their governance documents to counter the culture of censorship and so-called safe spaces. In a letter, Johnson wrote that it was the "legal duty" of universities to ensure as far as practicable that freedom of speech is secured for "members, students, employees and visiting speakers." This meant that all university premises should not be "denied to any individual or body on any grounds connected with their beliefs or views, policy or objective." March 22. Khalid Masood, 52, drove a car at pedestrians on London's Westminster Bridge and, armed with two knives, stormed the parliamentary estate. He killed five people and injured more than 50 before he was shot dead by police. Masood, a convert to Islam, was born in Kent as Adrian Elms. During his school years, he used his stepfather's surname, Adrian Russell Ajao. A former English tutor, he was unemployed at the time of the attack and had been living on social welfare benefits. Masood, who had a history of criminality — he had previous convictions for assaults, including grievous bodily harm, possession of offensive weapons and public order offences — was reportedly radicalized in prison. March 23. The Islamic State claimed responsibility for the Westminster attack. "The perpetrator of the attacks yesterday in front of the British parliament in London is an Islamic State soldier and he carried out the operation in response to calls to target citizens of the coalition," the group's Amaq news agency said in a statement. March 23. Prime Minister Theresa May said that it would be "wrong" to describe the jihadist attack on Westminster Bridge and Parliament as "Islamic terrorism." Instead, she said, it should be referred to as "Islamist terrorism" and "a perversion of a great faith." "When he first came out he told me he'd become a Muslim in prison and I thought he was joking. Then I saw he was quieter and much more serious. I gave him some cash-in-hand work for a few months as a laborer. He said he needed time to pray and read the Koran — something about finding inner peace. I heard he'd split from his partner and got even more deeply into religion." March 25. Police investigating the Westminster attack concluded that Khalid Masood acted entirely alone for reasons that may never be known. "We must all accept that there is a possibility we will never understand why he did this," deputy assistant Metropolitan police commissioner Neil Basu said. "That understanding may have died with him." Meanwhile, British security services reportedly do not like the term "lone wolf" because they feel it glamorizes an attacker. They prefer using "lone actor" instead. March 28. Kevin Lane, a convicted murderer who spent 20 years in British prisons, including HMP Woodhill and HMP Frankland, told the BBC that he saw many inmates pressured to convert to Islam and carry out attacks on other prisoners. "I have seen many attacks within the prison system," he said. "One man boiled fat and poured it over someone's head because of an insult to Islam." A spokesman for the Ministry of Justice said: "The allegations put forward by the former prisoner are historic." A: As a teacher, a very professional man. He was an excellent teacher. He got on well with his non-Muslim colleagues. A very friendly, stable kind of guy, really. He was not interested in the politicized version of Islam. He had no contact with any of the extremist groups. He was more a practicing Muslim who was committed to his faith, committed to his family and was focused on his career. I don't think he was influenced by extremist groups at all.... In fact, I'd go as far to say that he was the antithesis of a violent radical. March 30. Acting Metropolitan Police Commissioner Craig Mackey said there was a slight increase in "Islamophobic incidents" following the Westminster terror attack. Breitbart London reported: "The statement which New Scotland Yard sent along with its figures suggests the rise may not be due to a genuine increase in Islamophobia, but could instead be due to a 'community engagement plan' which sees the authorities actively encourage Muslims to come forward with allegations following what they describe as 'trigger events.'" The Met, the police service for the Greater London area, now employs 900 specialists focused on monitoring so-called Islamophobia. March 31. A new biography of Prince Charles revealed that the heir to the British throne tried to halt the U.S. invasion of Afghanistan to "honor" Ramadan. 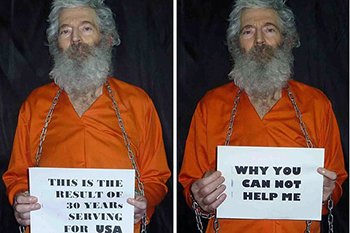 He made the plea in an "urgent call" to William Farish, the American ambassador to London, four weeks into the huge military operation launched after the 9/11 terror attacks. Farish recalled: "Prince Charles asked me if it would be possible to stop the invasion to honor Ramadan, and if I could convey that request to President Bush." The ambassador replied that it would be difficult to halt a military invasion already in full swing, but the prince allegedly protested: "But Americans can do anything!" Farish asked: "Sir, are you really serious?" Prince Charles replied: "Yes I am." Sharia law? In Britain? Insanity leads the way now. One commenter has it right, I suppose. It's Arab money that runs England now. Well, it was quite an empire once upon a time. Islam is not compatible with British law and values. Britain is not a multicultural country. It is a country whose laws and values are based on the Christian moral code. So whether you believe in God or not our laws and values are based on the Christian moral code not Islam. The UK allows those who abide by the laws to live peacefully in the UK. The multiculturalism agenda is for the Muslim population only every other society in Britain lives under the existing laws of the United Kingdom. This multiculturalism nonsense has allowed Muslims to push their Sharia Law agenda and we need to close all Sharia courts / Tribunals in Britain. Before the racism brigade turn up, Muslims are not a race and I am mixed race, I just see through this kind of nonsense, their aim is to confuse to achieve another agenda more Sharia in the UK. No thanks to Multiculturalism and Sharia Law. The United Kingdom does not need rebranding. A truly shocking list of malfeasances in the UK during a short period. which is, so far, unpunished in the UK. they refer to cowardice & segregation. Either: 1) Prince Charles is simply a loon which confirms a great deal; or, 2) He was doing the bidding of his money masters in Saudi Arabia. Pretty much validates worst fears about elites. And, does it really take a Ph.d to realize that Sharia Law and any Western secular legal system built on a foundation of Judeo-Christianity are simply incompatible. So sad to watch UK simply slouch toward destruction of its culture. Winston Churchill would weep. The only reason I can think this madness goes on is business, just how much Arab money has been pumped into the UK economy. My countries politicians appear to have sold their souls for barels of mid east oil, it is disgusting. Re: total of 29 people were charged after girls as young as 11 were raped and sexually abused in Huddersfield. West Yorkshire. This is an outrage that should result in castration of the racist offenders who prey exclusively on white girls. Deport their extended families, and arrest imams and close the mosques they attended for failing to instill any morality whatsoever. We do these things or admit that we accept it happening over and over again ruining the lives of our youth. Punishment for blasphemy ? These people come to our country or become "home grown" terrorists, and then attempt to drag our civilisation back hundreds of years. Christianity is the established religion here, anything else is tolerated peaceably and without violence. Multiculturalism is something we can do without too. Labour used to "celebrate" it 20 years ago, enough said. If these people do not like our lifestyle they do not have to remain in our country. Without them we could save millions on our security services. Britain should not be adjusting to Islam, but forcing Islam to adjust to Britain. A restoration of the death penalty for violent crime, deportation and revoking citizenship for terrorist sympathies would be a help. A country cannot have multiple cultures and laws -- one must abolish the other. Aristotle claimed that the sign of a dying society is its dedication to tolerance coupled with apathy. The British media and government endorse the former by privileging the 'rights' of one minority group over those of the bulk of the indigenous population. It furthermore encourages the latter by disproportionately placing people of a certain 'faith' in influential positions, whereby a narrative which denigrates the host culture is actively pursued. This is criminal and, if permitted to continue, will destroy my country. We are only marginally behind Sweden, Germany and France in a race to the bottom. Further to your entry for March 29th re the Westminster attacker Khalid Masood, further info can be found via this link to a Sunday Times article of April the 9th. which shows that Masood was very involved with a mosque in Luton, Bedfordshire. The info appears to have been uncovered by two Sunday Times reporters, rather than having been volunteered to the police by the mosque. Why ? Nobody can know who their work colleagues are in contact with - why is Farasat so keen to give him a pass? And his comments about Masood's personality: "very professional" / "excellent" / "very friendly, stable" / "committed to his family" / "focused on his career" don't sound remotely like the violent, unemployed man who had deserted his family and was living on benefits. Something being covered up here ? For all the hoopla about seeing Muslim faces o TV, that does not seem to have worked in the USA. Where great attempts were made to include Black programming advanced black talent etc.,. They can complain that not enough was done but several black actors have risen to stardom fame and riches, but it doesn't seem to have changed the general sense civil rights has failed the American black community. Yet literally America has invested trillions to find some solution. And the more attention the problem has gotten the more superficial the solutions would appear to be, and a once growing black middle class seems to have eroded especially under "regressive liberal democrats" that seem more concerned with causes than solutions media simply being a false negative to prove they care. I'm struck by the length of the list given the brevity of the time covered. How can a society based on law [Common Law in the case of the UK; Constitutional in my case as an American] allow a separate legal system flourish within their country? Wait, wait, the left doesn't believe in national borders. So-called multiculturalism is absurd on its face: Allowing a foreign culture [whether though legal or illegal immigration] to fester is to invite the end of the host culture. I urge one and all to read "The Challenge of Dawa," Ayaan Hirsi Ali's new book. This is a small example of the realities of the UK today. Not only do the politicians, bow to Islam, but media outlets, hospitals and schools. People have to ask, why this is happening, and why do we need to tolerate the intolerable in our own country? Not only is cowardice a big factor, but we in Britain are being forced against our will to put up with extremists returning from fighting with Islamist groups and free to walk the streets. Okay, the government will no doubt defend this with the same old excuse of there being no "evidence" of these terrorists actually murdering people. But as we all are aware, they still pose a serious threat. The worst thing about all this is the fact that it has been made public knowledge that there aren't enough resources to monitor the thousands of potential terrorists in our midst, and the Muslims know this, only too well! We also have yet another PM who is madly in love with Islam and sees no threat in what goes on, in their communities. FGM is blatantly ignored, women are subjected to the humiliation of a Sharia Council when wanting to escape a brutal husband, who is able to divorce her easily enough, but she is not granted the same privilege. And it always amazes me about how Muslim sons treat their Mothers, how can they so readily abuse them, just as their father has done? We all can agree that it is a cultural thing, but why is our government not doing enough to tackle this, and why are those women who don't understand or speak English being left to be completely controlled by their husbands and other, male relatives? This is Great Britain, not Pakistan or Bangladesh or some Middle Eastern country. Shariah should be banned and should have no place at all in our society. It's a man made governance, that has no relevance in the 21st century. Islam has to change and Muslims have to accept that they live in the West now, and their archaic laws no longer count or matter here. And the government needs to remind them of this! Typical. The laws in Britain are not sharia laws, nor should they ever be. Britain is for the British, therefore they apply to all those living in Britain. You don't like it? Then leave! Heard enough -- need to admit the truth. Britain can not provide security for it's Jews. The Jews will be the easy target for the jihadis. Better to be honest and try to avoid future disaster for the Jews in U.K. Simple, admit the truth -- let them have the necessary time to leave . The future security for the Jews will probably not get better -- in fact it can get much worse. The problem in the west is that our leaders refuse to demand that those who come to our countries adhere to our laws. Previous immigrants have integrated into our countries but for some reason (oil?) Muslims have been encouraged to come to our countries and tell us what we can and cannot do, changing our laws to suit them. Not only has this caused a problem for those of us in the west but also it has prevented those Muslims who came to the west to enjoy our freedoms from living the lives they hoped for. In fact what they have observed is that violence on the part of their co-religionists has brought them the power they seek, but moderate Muslims dare not speak up for moderation because they receive no support from our weak governments and are likely to be targeted by their community or even their family.